Heartland says goodbye to Season 10 with a new addition | TV, eh? 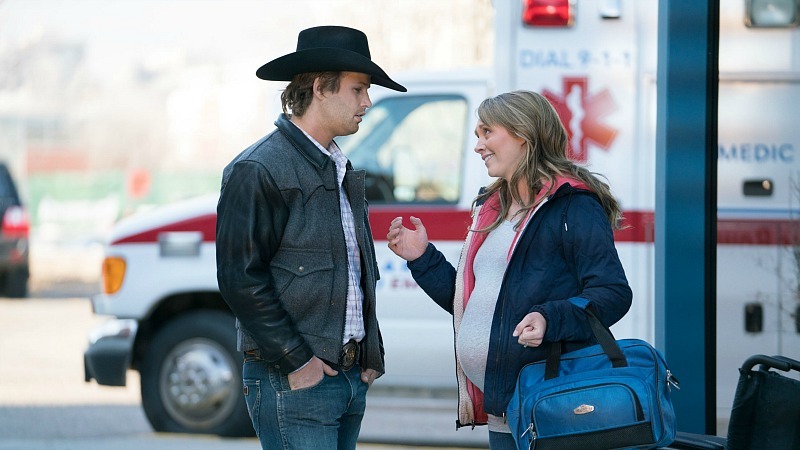 If you’ve seen the teaser commercials for Heartland‘s season finale, you know Amy has the baby. But will “Greater Expectations” be a love-in all episode, with every character going goo-goo over the little sprite or would other storylines be featured? That was my big question before watching a screener. Amy, Ty and the entire Heartland family are thrilled to welcome a new member into the fold. Meanwhile, the ghost horse returns and Amy disagrees with Georgie’s plan to capture and gentle him. Then, Lou changes her mind about a business deal but not before Mitch makes a surprising choice. Ghost, that mysterious horse with the black spots returns, and Amy and Georgie are transfixed. Is Ghost a good luck charm or a harbinger of bad things to come? Tim voices his concern, but Caleb is adamant: he and Cass are getting married and Ty is supposed to be his best man. The only issue is that Caleb is currently unemployed … and that’s where Tim comes in. Is Tim willing to hire Caleb as an instructor at the rodeo school, or will he send this cowboy packing? It’s not often that Jack and Georgie have their own storyline, but they get a doozy on Sunday. It involves Ghost. That’s all I’ll say, except that I hope the pair get more screen time together in Season 11. Did Lou listen to Lisa’s advice, or did she partner with Peter? You find out on Sunday. Her choice has a ripple effect on what Mitch does next. Let me know what you think of Sunday’s finale by commenting below after you watch it! I only wish I could enjoy it like you will. We are in the States and I have watched from Netflix to randomly all over the place. I am caught up with you. I never liked the entire story line that Ty left to go to a far off unstable country with your wife pregnant. I never wanted him to go. I hope the show goes back to its grassroots and be more of family and the horses. I really think it lost something with Ty away and the character of Lou., what is going on with all her I me atw6ay, it does not work. I really like the chemistry with Mitchell and stay away from Peter and business. Didn’t she learn from their past.